Godzilla: Monster of Monsters is an action game developed by Compile for the NES and published by Toho, first in Japan near the end of 1988, and then in the US in 1989, and finally in Europe in 1991. 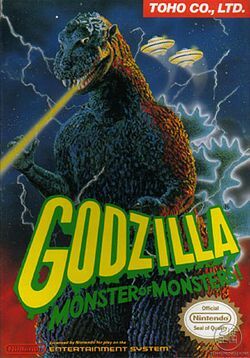 The game gives players a chance to control the eponymous monster Godzilla, along with an ally of his known as Mothra. The player uses both monsters in turn by selecting the desired character on a virtual gameboard, representative of the planet it is on, and moving it like a chess piece. Each space is a hexagon that represents playable, side-scrolling levels. Each board contains several monsters from the Godzilla series and some from other Toho movies and the objective is to clear each board of enemy monsters before advancing to the next board. Battles are fought when the player moves Godzilla or Mothra adjacent to an enemy monster. More monsters appear on each stage until nearly every monster in the game is featured. When the player reaches Planet X, every previous monster is present along with King Ghidorah himself. The monster battles have a time limit of forty seconds but lack a countdown timer. Both Godzilla and Mothra start the game at level 1, and with a limited supply of life and power. The monsters can gain levels by defeating bosses and certain stage types (Ruins and Hyperspace); every time Godzilla or Mothra gains a level their life and power bars will increase. The maximum level is 16.The life bar will replenish once a boss is defeated, or when a Life Capsule is picked up. The power bar recovers by itself over time, and the more life the monster has the faster it recovers. In 2XXX A.D. when the orbits of Pluto and Neptune exchange their positions, the Earth receives a declaration of war from an unknown planet. This page was last edited on 2 May 2015, at 02:39.